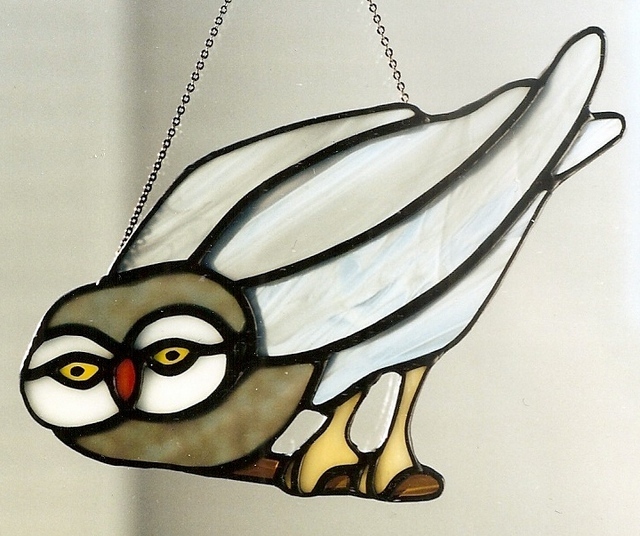 Quite a few years ago we made these Whimsical Owls. The first one measured approximately 7.5 inches wide x 4.5 inches high. 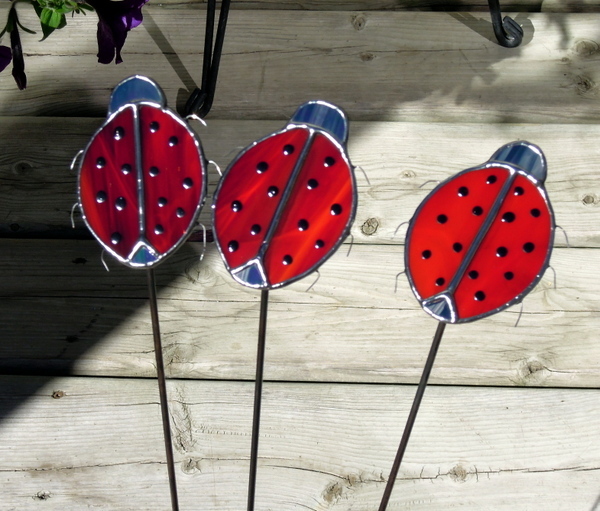 The second and third ones approximately 6 inches high x 3.5 inches wide. 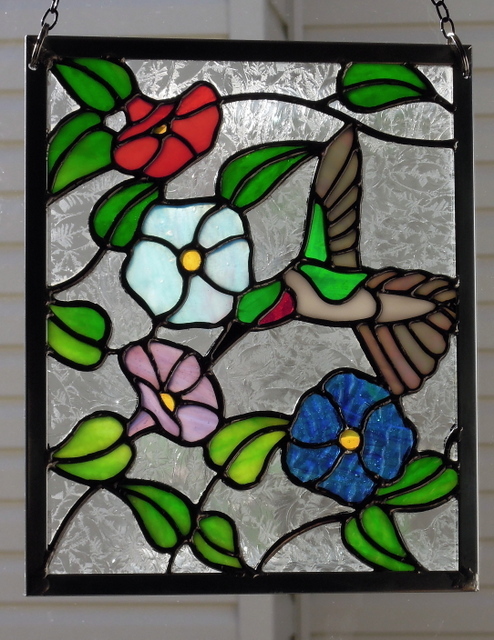 This hummingbird panel measures approximately 7.5 inches wide by 8.5 inches high not including the outside zinc frame. 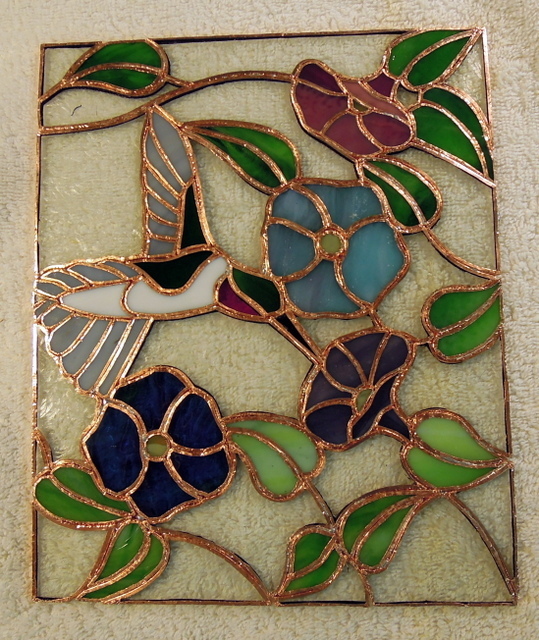 It was commissioned this fall by a local client who is sending it to Clare, Nova Scotia as a Christmas present for her mother in law who loves hummingbirds and morning glories. The background glass is clear single glue chip. 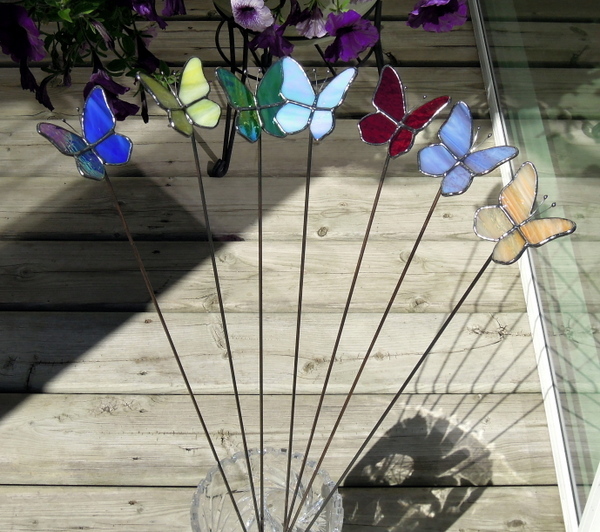 For the wing feathers we used an iridescent grey Spectrum Glass. 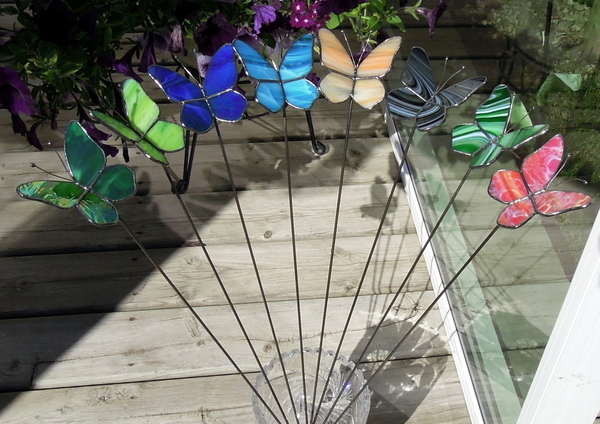 For the leaves a beautiful green Uroboros and for the morning glories a cranberry white Bullseye, Youghiogheny Heads & Tails for the blues and a Kokomo for the purple one. After completing the design we frame the pattern with the Morton Layout block system. We use white ceiling tiles doubled together as our pin board. We draw out each piece using white freezer paper which can be found at Safeways. It works very well in that one can clearly see the pattern lines through the freezer paper for tracing purposes. 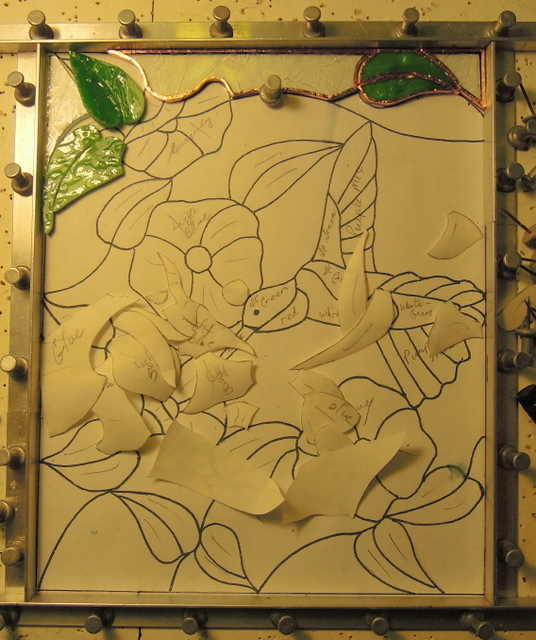 We then glue the pattern to the piece of glass we want to use ensuring that we have the correct flow of that glass for it’s relative location in the pattern design. Each piece is then ground to fit, foiled and burnished then the next piece is traced and the process continued until the panel is finished. 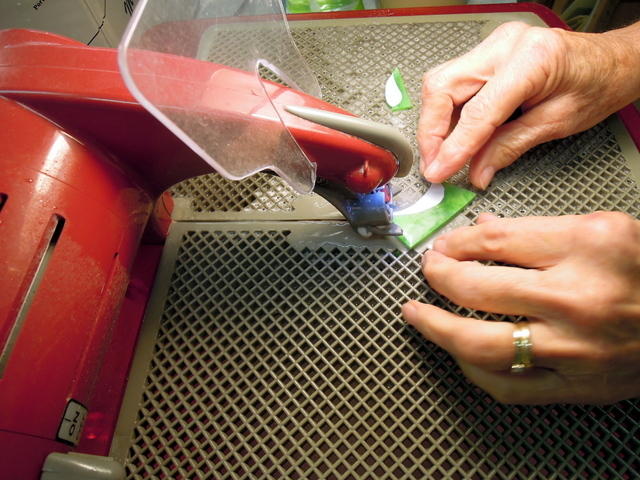 In the next picture we are using our Taurus 3 Ring Saw to cut the Uroboros glass used for the leaves. In this case as we had to reverse our pattern onto the glass as we wanted to use the textured surface on front of the panel. 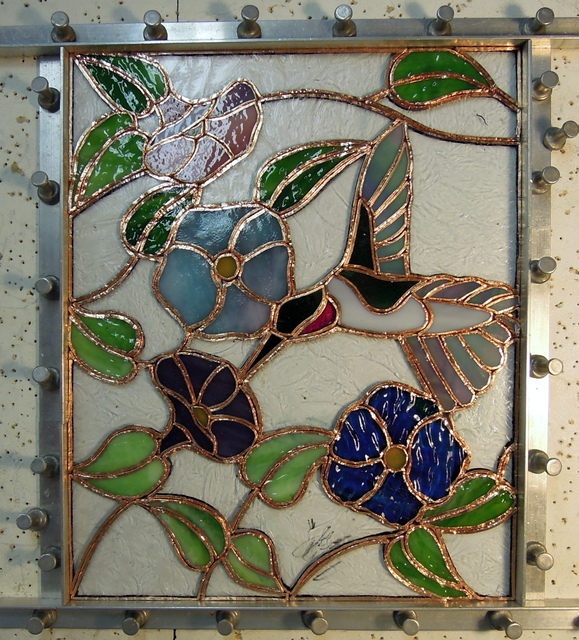 The following photo shows the panel completed and ready for soldering. We use 60/40 solder for the majority of our work. The last photo shows the reverse side after the other side has been soldered. 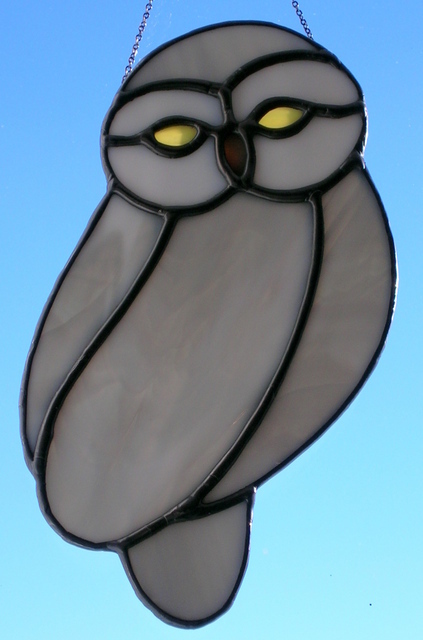 You can see that using our methods of tracing and fitting each piece of stained glass, little solder seeps through. 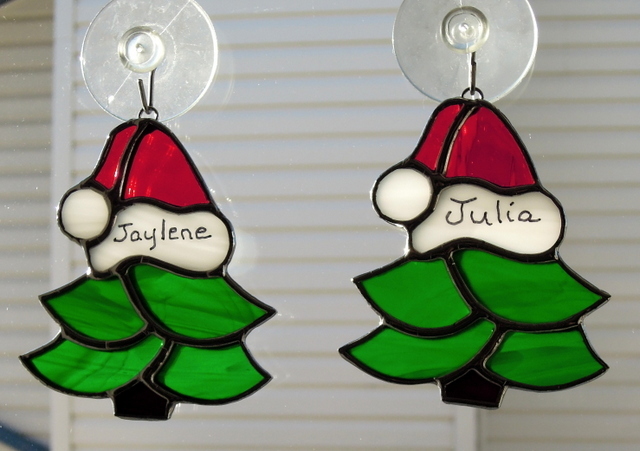 For Christmas time we always make a tree ornament for our neighbors daughters. This was our choice this year. 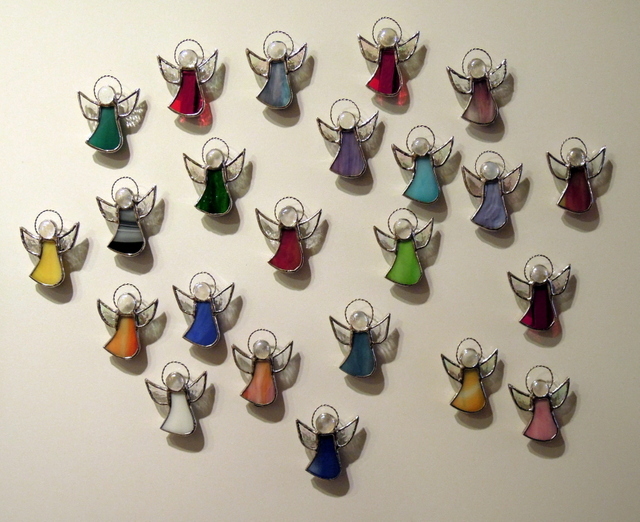 We have a client who wanted mini angels that could be used as a lapel pin and also end up being used as a refrigerator decorative magnet. We were successful in obtain a rare earth, 2 magnet combination that worked perfectly. 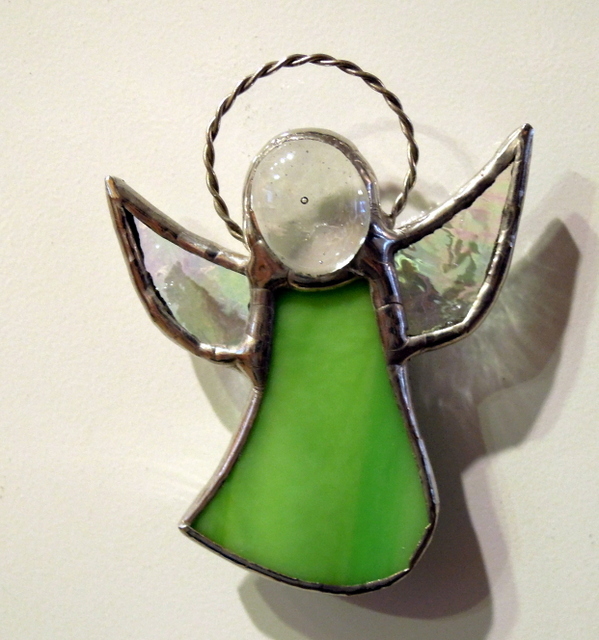 We had to slightly enlarge our mini angel design to accommodate the magnetic strip. 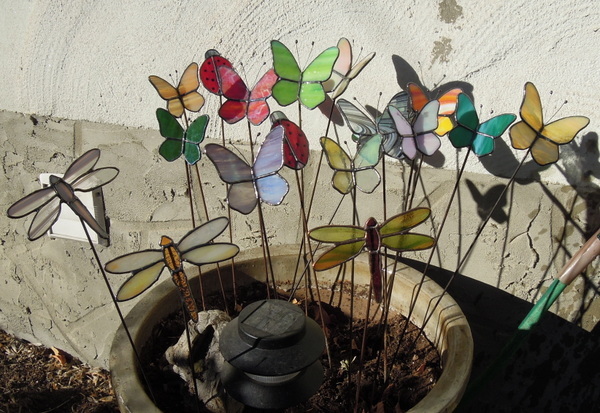 These mini angels were given away as gifts. The first photo shows the complete collection on our refrigerator door. 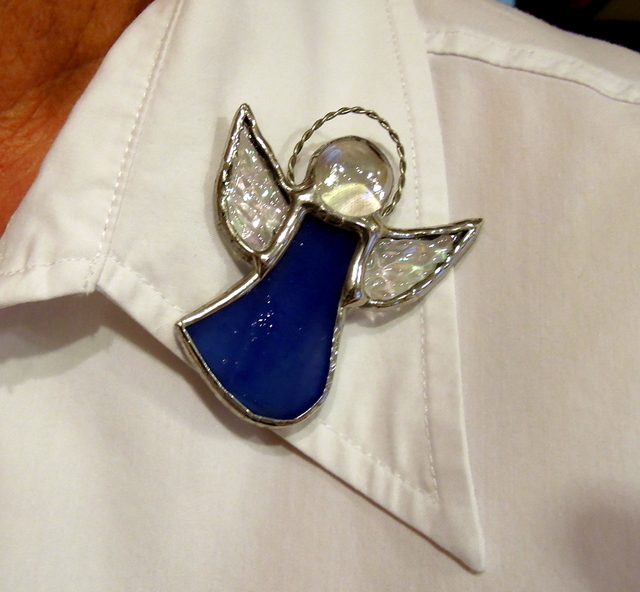 The next photo shows the mini angel on a lapel which is held by the magnetic strip attached to the reverse of the angel.